On this date in 1915, the passenger ship SS Eastland rolled over while docked in the Chicago River. 844 passengers and crew were killed making it the largest loss of life from a shipwreck on the Great Lakes. 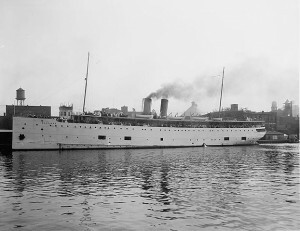 The SS Eastland was owned by St. Joseph-Chicago Steamship Company and was launched in May 1903 . Problems were discovered from the start. Design flaws made it top heavy and its center of gravity was too high. When lots of passengers congregated on top deck, the ship would list. While some modifications fixed issues, there were still listing problems. SS Eastland also achieved notoriety in August 1903 for a mutiny by the ships firemen. On 14 Aug, while traversing between Chicago to South Haven, Michigan some fireman refused to stoke the fires because they had not received their potatoes. The captain ordered the men arrested. Two firemen who did not participate in the mutiny had to stoke the fires until they docked. The six men were arrested by the police and later the captain was replaced. This image is now in public domain. On 24 Jul 1915 the Eastland and two other passenger steamers were chartered to take employees of Western Electric to a picnic in Michigan City, Indiana. For the workers, it was a major event since many did not take holidays. Boarding began at 0630 and by 0710, the ship had reached its capacity of 2,572. The ship was packed and passengers filled every possible place on the upper decks. The ship had already begun to list to port and the crew tried to balance the ship using the ballast tanks. That did not work. Numerous passengers passengers apparently rushed to the port side making it worse. At 0728, the ship lurched sharply to port and rolled over to rest on the river bottom twenty feet below the surface. Because so many were below decks to keep warm, they were trapped by the sudden rollover. Heavy furniture-pianos, bookcases, tables-crushed many inside. The Kenosha responded immediately and came aside to allow those stranded on top to jump aboard. But for those trapped below, there was no rescue. The bodies were retrieved and taken to temporary morgues. The president and three officers of St. Joseph-Chicago Steamship Company were indicted for manslaughter. The ship’s captain and engineer where charged with criminal carelessness as well. However during an extradition hearing (all six were in Michigan and had to be extradited to Illinois to stand trial) the federal judge believed there was not enough probable cause citing lack of evidence and refused to extradite. He further said the captain and engineer were merely doing their jobs. Ironically because of the 1915 Seamen’s Act passed after Titanic’s demise, the additional weight of the lifeboats probably worsened the top-heavy issues of the ship. A historical marker along the Chicago River marks the event. Plans are also underway to construct an outdoor exhibit where Eastland sank. The Eastland was raised and sold to the Illinois Naval Reserve and commissioned USS Wilmette . She was reconfigured as a gun boat and primarily used for training. Her only action came after the war when she was tasked with sinking a captured German U-Boat in 1921. Most of her career after that was training naval reservists. In 1941, her training duty was altered to train naval armed crews on merchant ships. Her most prestigious task was to take President Roosevelt and others to Whitefish Bay to plan war strategies in 1943. She was decommissioned in 1945 and sold for scrap in 1946.